This Architect is designing these spectacular log mansions for a 300 acre site near Franklin, NC. The house plans will have about 8,000 heated square feet for the Main House, and features a remarkable trademarked window & door system that uses groups of sliding doors up to 12 feet tall that retract and hide completely when fully opened, resulting in nothing in the way of your view to your site! The great room area encompasses the Hearth Room, Dining, Kitchen and Reading areas, all of which has been pushed into the view of the site so that 3 sides of this space have the large, retractable doors, which places this lucky homeowner right into his view with little to no obstructions. Log mansions designed by Rand Soellner. 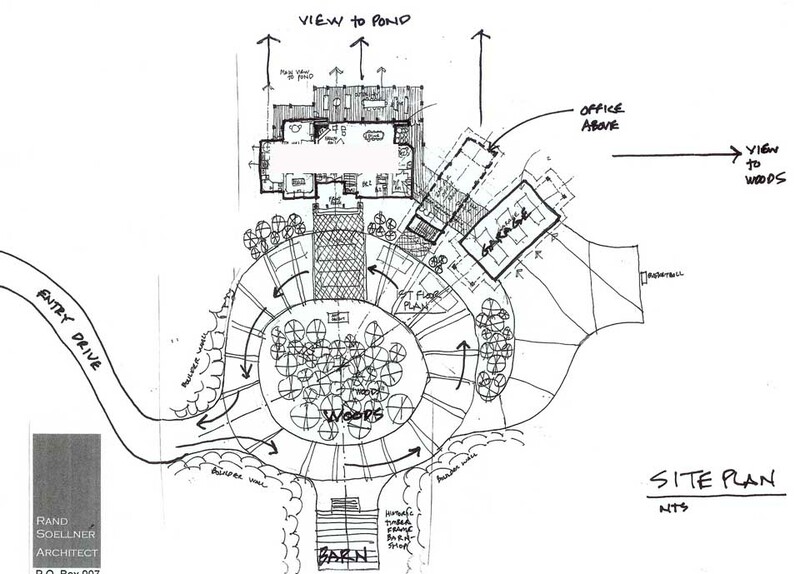 Here, the main log mansion is at the top of the site plan, with bridge, office and garage/cottage to the right. A barn/workshop in on the lower portion of the plan. A central woods – courtyard has large flat boulder stones in the driveway encircling it. (C)Copyright 2005-2010 Rand Soellner, All Rights Reserved Worldwide. No where else on planet Earth will you find this high-quality level of luxury house design refinement: Big Ideas with fine detailing. Even the term: log mansions conjures imagery that is exciting. A large motor court gives access to a separate timber frame work shop, 3-car garage area, guest quarters over the garage, breezeway/decks, front entrance, and a playful series of steps and platforms that lead to a residential office that can be accessed from the front motor courtyard or the house’s interior (for those of you with residential offices that wish to preserve the privacy of your house). This homeowner wanted Rand’s trademark Big Log western log look, with 3 foot diameter log posts supporting the front porch roof. We design log mansions and log cabins and other log style homes. In the rear, overlooking a private pond, Soellner arranged the main spaces of this residence, providing huge open views of the surrounding pastoral setting, with mountains in the distance. This is a one of a kind combination of design ability and technical knowledge, focused on mansions of a particular type. If you are after mansions like this, there are not many design firms that have this sort of experience. Log mansions designed by Home Architects for family village. (C)Copyright 2005-2010 Home Architect, PLLC, All Rights Reserved Worldwide. Mountain Dream Log Mansions was another company in which Home Architects was the design arm. Although this venture is no longer a combined entity, the various companies of which is was composed still exist and can still serve you, on an individual basis. 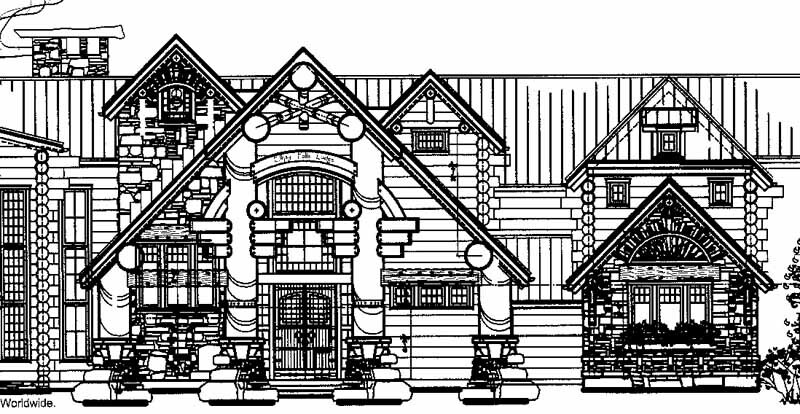 If you are interested in log mansions and might be looking for a contractor and architect working together to meet your objectives you may want to look at this hotlink: Mountain Dream Log Mansions. The advantage of this project approach is that you would have an outstanding proven team of designers and contractors to manage, design and build your project. They are all familiar with the project process and place your objectives first. They begin by listening to your needs, dreams and wishes, recording them all into a programming report that is provided to you for your review, possible modification and approval prior to the design beginning. At each phase of the design, you are given the opportunity to input the process, to make sure you are receiving the design you want. The log home designs of Rand Soellner Architect are available to people in every state in the country and around the world. Rand Soellner: log home architects who designs special projects to suit people’s unique lifestyles and project sites. tags: log mansions, cabin architect, cabin designers, timber frame, post and beam, mountain, castle, cottage, rustic, stone, vacation house, open plan, resort, boone, lake lure, seattle, tacoma.